This U.S. Open is the most unknown quantity ever going into Chambers Bay. It continues the "very different" theme by the USGA that we saw at the brilliantly revamped Pinehurst no 2 last year. On that occasion Martin Kaymer's thrashing of the field on the Crenshaw/Coore masterpiece was truly an exhibition of nerve and ultimate course management. If last year was the Olympic Games at Pinehurst, this year is the X Games in Washington State on a course designed by Robert Trent Jones Jr. as a feast for the eyes. A more spectacular setting will be hard to find with links conditions and feel overlooking the Puget sound but with green complexes on steroids. 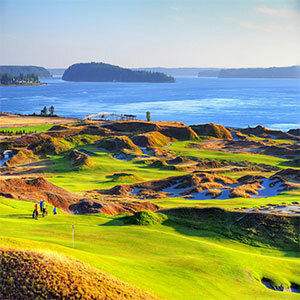 This venue is a risky one for the custodians of the game in America as it will either be seen as brave to hold the National open at Chambers Bay and if successful, there will be a healthy dose of "I told you so" flying around. If the players start to look like fools though, the opposite will be true. That said, somebody is going to be the U.S. Open Champion this week but who will be able to cope with the side slope teeing grounds and the changing of par on 1&18 from 4&5 to 5&4 on different days and the greens; ah yes the greens. My five to follow are going in this week with a chance of winning and my first pick is Rory McIlroy. The World No.1 is stretching his lead at the top of the rankings and if he is on, nobody can live with him. It's been a strange couple of months for Rors with big wins, low scores and missed cuts. After missing the cut at The Irish Open after a 5 week stretch on both sides of the Atlantic, Rory has been able to recharge and come to the U.S. Open relatively fresh – but will he like the fiddly test that's coming his way? I'm not so sure. The glory of Rory is when the Rev counter is up and he can let fly with that beast of a driver and send 3 irons into the atmosphere to land on a small target 250 yards away like a raindrop falling down a well. Unbeatable. I fancy when all is said and done and young RMac hangs up his clubs, every test will have been conquered. But will it be this one, this week? My second pick is the Masters Champion Jordan Spieth. A young man that plays with fire in his belly and the only player that can do the Grand Slam this year. He is maturing at the age of 21 at a ferocious rate (footballers take note).When he makes mental errors on the golf course, he addresses them and comes out next time a better and more dangerous golfer. Winning The Masters is one thing but to break nearly every record on the way doing it at his tender age is just remarkable. He has set his stall out to give Rory a run for his money and is already the World No.2. He is a complete golfer with a big heart and also we must factor in that his caddy Michael Greller is from, guess where? Correct: Chambers Bay. That has to be an advantage on a layout where the designer thinks you need 10 practice rounds to 'get it'. Next up is Rickie Fowler who is a natural links golfer despite being from the United States. He plays the knock down game so easily and if it gets windy then that will be a huge asset. Criticised in some quarters for not winning enough despite running 5th or better in all four majors last year, he gave them all one in the eye when he spectacularly won The Players with a finish only achievable on an Xbox. Eagle 16, birdie 17, birdie 18 then going the extra mile to win in a play-off. Rickie has the bit of big time that you need to produce your best against the best and could be a factor this week. Adam Scott has been a little left behind of late by the above but don't forget what a good player he is. After a brief dalliance with a normal putter he's back with the big stick again and looks much more sure-footed on the greens. Steve Williams is once again his bagman and they should have won the Open a few years ago when Ernie pinched it at Lytham and then of course went on the next spring to pick up a green Jacket at Augusta. Steve is the iron will that drives Adam and turns him into a more effective winning machine and that will be needed in bucket loads this year. Last but not least is gentleman Jim Furyk. Into his forties now and over the last few seasons has been pulling his hair out having not had the wins his play has deserved. Time and time again he would find a dramatic way not to win, but he put that to bed at Harbour Town this spring when he played as well as you can to eventually ease out Kevin Kisner in a play-off. The confidence gained from that killer finish could be pivotal this week as Chambers will play right into his hands. Furyk is like a boxer without a big punch, unable to end the fight early with a knockout but he can grind you down, go the 12 and win on points. On Sunday, he will be the last man standing. I'm tipping Jim Furyk to win what will be a grind of a championship. Enjoy the golf, it will be different.